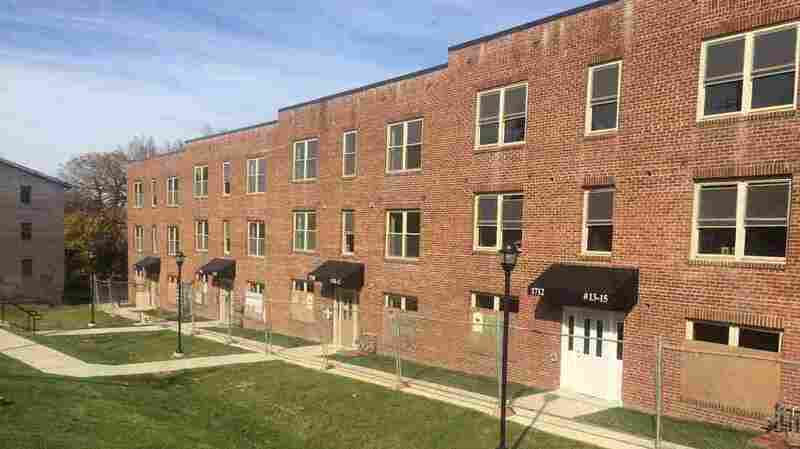 Affordable housing condo buyer Marilyn Phillips says she had to jump many hoops before purchasing her unit in D.C.'s Anacostia neighborhood. In Washington, D.C., a city with one of the highest costs of living in the nation, low-income residents are having trouble buying affordable housing — not because of a lack of it, but because of all the red tape. "The affordable units we're selling for $171,000, and the market-rate units we're selling for $230,000. All the market-rate units sold in two months, but it's taken me 11 months to dispose of 11 affordable dwelling units," he says. "Part of it is this square-peg-into-a-round-hole thing that we try to do in housing, and that's a conundrum," Crowley says. She says this conundrum exists nationwide, and in D.C., it's compounded by more requirements: Prospective buyers of affordable housing must also attend homebuying training, and if they want to get a loan, they must navigate the labyrinth of city government. The D.C. government and the federal government want to make sure that the subsidies that they're providing are going to people that actually need them. "People can get frustrated with all the hoops you have to jump through," Phillips says. "All of the information they want to gather from you, it can make you feel like, 'Why do you need all this information?' "
"I pay most of my Social Security disability check to my landlord now. I pay $900 a month. My mortgage at this new place is only $224 a month," she says. "The D.C. government and the federal government want to make sure that the subsidies that they're providing are going to people that actually need them," Scruggs says. But what happens is many low-income individuals decide to just keep renting or scrape their pennies together for a market-rate unit "because they don't have to deal with the paperwork required to buy an affordable dwelling unit," Scruggs says, "and they don't have to deal with the restrictions." For example, there's a restriction in D.C. that limits maximum resale price and makes homeowners wait anywhere from five to 20 years before they sell. Michael Kelly, director of the D.C. Department of Housing and Community Development, says he understands how unwieldy the process can be. "Unfortunately, with all government programs, there are bureaucracies and provisions that go with that," he says. "We're doing everything we can to streamline that effort."